and cloaking Virtual Machines to be used for Cuckoo Sandbox]. this release including the Microsoft Office 2007 integration. different subcommands, each to fulfill their own task. calling vmcloak-xyz or vmcloak xyz on the command-line. whether it will 32-bit or 64-bit (32-bit being the default). still have to mount the Windows ISO file and setup vboxnet0. # Install the latest vmcloak. # Mount the Windows 7 Installer ISO. # Ensure the hostonly adapter is up. # Actually initialize the 64-bit Windows 7 VM. Moving forward it is time to install a couple of software packages in the VM. all the dependencies that should be installed. provided as options to the dependency. it will be used by Cuckoo, and the static IP address to assign. twenty Windows 7 VMs which each take up to 10GB. seven0p1 (or, seven0 with one patch applied). a time, life has just gotten slightly easier again. first blogpost features Man in the Middle support for Cuckoo Sandbox. snooping of HTTPS traffic paragraph). So, man in the middle? Providing a CA Root Certificate to allow a MITM proxy to intercept traffic. Transparent dumping of TLS Master Secrets to decrypt TLS traffic. outside of the actual analysis, as will be outlined in this blogpost. Brad Spengler for continuously providing feedback and bug fixes). The Honeynet Project member Maximilian Hils. VM running either Windows XP or Windows 7.
creates a unique set of certificates). This technique is not compatible with Certificate Pinning. 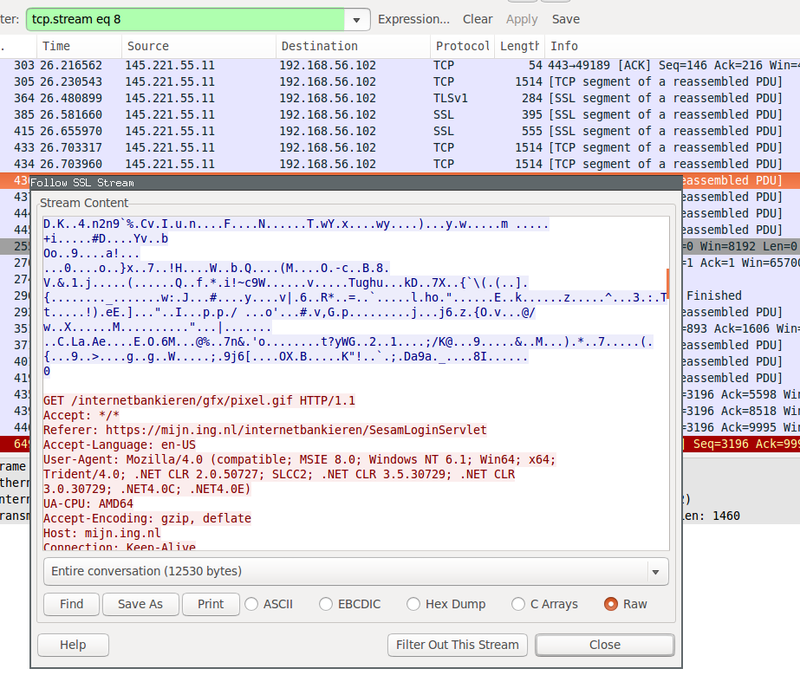 Looking at the PCAP file all traffic goes to the proxy. point no support has been provided for other applications). software in your corporate network). not available to Cuckoo once it is running. I have to look into this later..
not compatible with Certificate Pinning). turn allow one to fully decrypt the TLS stream. information is required to decrypt TLS streams in Wireshark. in the TLS protocol, can be extracted from the Server Hello record. record and once from the PRF “key expension” function call). just to the instrumented lsass.exe service. the TLS/HTTPS encryption. Including those of Windows Update, etc. PCAP file looks the same as it would without our transparent sniffer. to operate multi-gigabyte files – in-memory loading and all that). Windows 7 virtual machines for Cuckoo Sandbox. virtual machines is now just as easy as creating Windows XP virtual machines. # Ensure VirtualBox' hostonly adapter is up. # Create a Win7 VM with the name win7_0. # This will take about 15 to 20 minutes. –win7 and –x64 flags straight into the –win7x64 flag. Attach the immutable bird image. Configure a unique static IP address for this VM. Run Cuckoo and take a snapshot of the VM. Naturally all these steps are handled by vmcloak-clone. and less than 1gb per clone. to install Windows 7 once and then re-use this installation). # Create the 64-bit Windows 7 Bird. Two directories for VirtualBox files. # Create vboxnet0 and assign the correct IP address. you’ll have to set the cuckoo directory so we’ll do this as well. on the machines I’ve tested it’s usually less than or roughly 10 minutes. VM ready to be used by Cuckoo. can be found on github. any questions don’t hesitate to email me or so. being loaded in every process that imports user32.dll on my system.. Yay! Needless to say it doesn’t have ASLR enabled, nor does it rebase by default. MessageBox() program, we attach Immunity Debugger to it. feedback in the form of rop.txt and rop_suggestions.txt. order to see if they’re all set correctly. First we start with eax. set to 0×40 using the ‘original’ “pop ecx ; retn” gadget. which is, again, documented here, and find the following gadget. just “another one of those”. restart gdbserver every time we hit “run” in gdb. when we were playing a CTF, almost two months ago. to do arbitrary function calls during debugging such as the following. No symbol table is loaded. Use the "file" command. try using the "file" command first. Error accessing memory address 0x0: Unknown error 18446744073709551615.
time for the fun part. we look closely at the shellcode, we notice the following. stdin, stdout, and stderr. The following snippet shows the updates shellcode. This is the shellcode that we’re going to use. shellcode, and finally, running it. gdbserver to continue past that error. The final exploit code can be found here. Execution of the code may look like the following. We’ll need three shells. of the techniques involved in creating new Dex files. Proof of Concept DvmEscape application. Dalvik Bytecode there’s always the Dalvik Bytecode reference. Dirkjan is an awesome Dutch comic. A couple of weeks ago I stumbled upon the weekly feed from Veronica. keep up-to-date with two Dirkjans a week! the email address. Other information is optional and not very interesting. Dirkjan) and the legal disclaimer on the bottom of this blogpost. to damage Veronica in any way. say, Thumb allows for more compact code. whether you’re analyzing ARMv7 or Thumb. instructions at first, and go for the complete instruction set later. A small explanation on ARMv7 vs Thumb/Thumb2. then the instruction is decoded as being either Thumb or Thumb2. instruction is decoded as if it were a 32 bit word. Thumb2 instruction. Otherwise it’s a Thumb instruction. For questions etc, you know where to find me. Entry Point points to a page filled with zeroes. remaining code in the cache. a total of five times in this crackme. the decrypted code. Which, in turn, does some more rounds of decryption. does a custom strcmp() against the argument on the commandline. string ZenCracking. That said, we’ve solved the challenge..